This year, inspired by Gretchen Rubin's book, I've been doing a Happiness Project, focusing on one important aspect of my life every month. Last month, my focus was on spirituality, while September's goals are all blogging-related. The idea is that the months should build on one another and the habits formed in one month should continue into the next and so on. Each month I share my wins from the previous month, as well as goals that fit the theme of the current month. August's monthly goals were focused on spirituality, something I can always benefit from spending more time on. As busy as last month was, I'm glad I chose that as my theme, because I think it helped keep me sane during an otherwise overwhelming month. Here are my wins. - Established a nightly prayer habit with Jona. He was a little unsure at first, but I incorporated prayer into his nightly bedtime routine. At this point he just wants to listen--not say anything yet himself--but I think that's okay. I still haven't been able to make before-dinner prayers a part of our family routine; that time of day is so crazy. I think I should have established it long ago, because it will take time to relearn anything beyond our dinnertime survival strategies. And as far as Violet's bedtime goes... little miss Sassy Town is lucky to get a bedtime story. We'll get there with prayers eventually. Meanwhile, pray for me at about 7:30 p.m. nightly. - Set aside time every morning for scripture reading, prayer, and journaling. I love having quiet time in the morning when the house is peaceful; it's one of my favorite parts of the day. Also, focusing on scripture and prayer in the morning helps the rest of the day go better. - Read Man's Search for Meaning by Viktor Frankl. I listened to this on audio, and to be honest I couldn't get into it. I know that it's such a highly rated memoir, and I've heard nothing but good things about it. It may have just been the audio version I struggled with--the narrator's voice about put me to sleep. - Started my new job as a Communications Specialist. I love it so far! - Had a book club lunch date and discussed I Was Anastasia. - Voted in local primary elections. - Hosted Jona's ninja-themed 5th birthday party. I let Amazon and a local donut shop do the heavy lifting for this one. - Went from two childcare payments to one. Thank you, public school system. - Took a 3 day trip to Rhode Island for work. My intention this month is to focus on blog-related goals. For the past few months I haven't had time to do much other than create content a couple of days a week, so I hope to spend some time this month on more behind-the-scenes blogging tasks. Here are my goals. - Explore new income streams and take action on current opportunities. I'm not looking to turn my blog into my full-time job, but if I could make some extra bucks here or there, without sacrificing quality content, I'd love to. - Update outdated photos and information. - Update my Instagram bio. Instagram is my most-used social media platform, and yet I haven't updated my bio in a while. I'd also like to make little cover photos for my highlights (which I'm slowly getting better at using). - Create a blog game plan for both short-term and long-range planning. 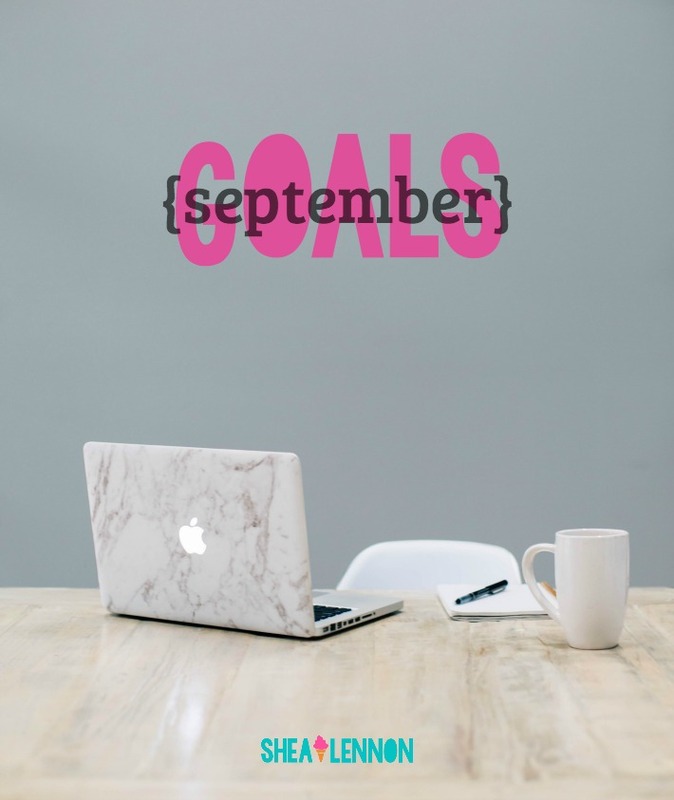 What are your goals for September? Have you had any big wins lately?